Wave after wave of Regina Pats came in on Giants goaltender David Tendeck during Sunday afternoon's WHL game at the Langley Events Centre. The Pats won in a rout. Regina opened a big lead and Vancouver never recovered in an 8-3 loss in front of 4,130 fans. Nov. 20, 2016 5:00 a.m.
You can’t spot the best major junior hockey team in Canada a 4-0 first period lead and have any hope of winning. That’s exactly what the Vancouver Giants did on a long Sunday afternoon at the Langley Events Centre. When the final buzzer mercifully sounded, the mighty Regina Pats had cruised to an 8-3 win in front of 4,130 fans. The Giants have now lost two straight and are 10-14 on the season. To say this was a tough day at the office was an understatement. Judging solely from the final score, this was a spill your coffee on your keyboard, leave your car lights on all day, misplace a vital document that was due last week kind of day at the office for the G-Men. Giants head coach Jason McKee didn’t exactly see it that way. He pointed to the shots on goal – 27 for the Pats, 25 for the Giants – and believes the game was much closer than the score indicated. The Giants were in deep from the get-go. Not only did the Pats enter the game with a WHL-best 15-1-3 record, they were likely in a prickly mood after suffering their first regulation loss of the season Saturday, falling by a 5-3 count to the Victoria Royals. 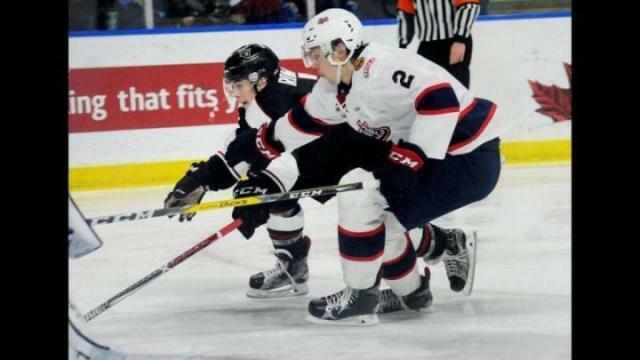 And, this is a Pats team that has no fewer than six NHL draft picks in their lineup, led by 2016 Anaheim Ducks first rounder Sam Steel, who going into the afternoon led the Pats – and the WHL – in scoring with 38 points. McKee gave the Pats full credit for the win. Giants goaltenders Ryan Kubic and David Tendeck had tough nights. Kubic surrendered three goals in the first period and was pulled and Tendeck allowed five the rest of the way. “Those are some pucks that have to be saved but at the same time, they’ve been good for us all year,” McKee said, of his goaltending duo. Both teams came out hitting in the first four minutes. Captain Tyler Benson had the best early chance, with a wide-open net to shoot at off a rebound, but fanned on his attempt. The Pats drew first blood midway through the opening frame off a Giants turnover behind the net. Regina’s Adam Brooks pounced on the loose puck and backhanded a centering pass to his linemate Luc Smith, who one-timed the puck past Kubic, who had no chance on the play. Brooks made it 2-0 for the visitors with 6:10 to play in the opening frame, snapping home a loose puck from the slot. The puck sailed over Kubic’s glove. Then, with Vancouver’s Dawson Holt in the box for interference, the Pats padded their lead. A fortunate bounce off a defenders’ shin pad went right on the stick of Nick Henry, who quickly snapped the puck past a surprised Kubic. This forced Kubic from the nets in favour of Tendeck. Regina kept pouring it on, again, off Giants’ miscues. On a Giants’ turnover, Regina’s Conner Hobbs quickly threw the puck on goal with a turnaround shot. The puck slid under Tendeck for Regina’s fourth goal of the period. The Giants had a much better second period, and got on the board when Johnny Wesley’s slapshot eluded Regina goaltender Jordan Hollett. The Pats struck back quickly, however. With Wesley off for high sticking, the Pats cashed in on the power play, with Steel finding Filip Ahl with a perfect diagonal pass. All Ahl had to do on the play was re-direct the puck into the open cage. Seconds later, Austin Wagner stuffed a loose puck past Tendeck off a net drive. The nicest goal of the night arguably came off the stick of Giants’ defenceman Dimitri Osipov, who chipped the puck past a Regina defender before beating Hollett low stick side. It was Osipov’s first of the campaign. The Pats took a 6-2 lead into the second intermission. Regina never relented and made it 7-2 40 seconds into the third frame when Henry backhanded a shot past Tendeck in front of the goal. The rout continued with a long snap shot from the Pats’ Rykr Cole sailing off the post and into the net. At this point, the night couldn’t have ended soon enough – seemingly for both teams. The Giants started piling up penalties in the third frame, giving the Pats an opportunity to hit double figures on the scoreboard. Vancouver scored the final goal of the game, however. Tyler Popowich scored a power play goal (his first in the WHL) with 8:05 remaining off a scramble in front of the net. Hollett injured his right leg on the play and had to exit the game. The Giants have a bit of a break in their schedule. Their next game is Wednesday when they visit Kennewick, Wash., to play the Tri-City Americans.